Whether you had to pay this year, or got a tax refund, several businesses want to ease your pain with deals and discounts on tax day, April 15. 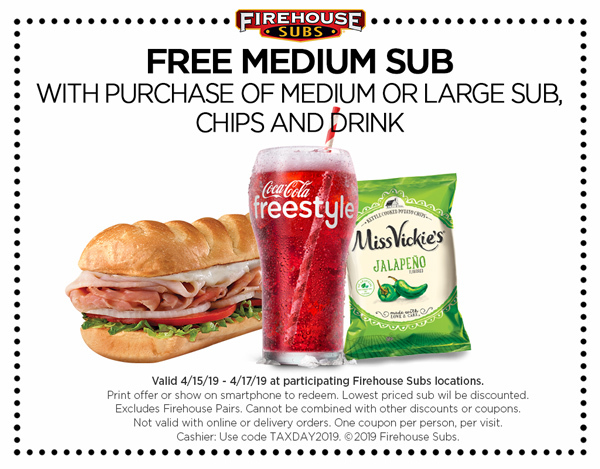 Buy a medium sub, chips and drink and get a free sub with this coupon . Valid Monday through Wednesday this week. Thanks to Tori for this tip. Buy one sandwich, get one free on April 15. Potbelly Perks members will see the deal in their account, non-perks members can tell the cashier it is Tax Day when at checkout to get the deal. Thanks to Nicole for this tip. Get a free original chocolate chip cookie at the Great American Cookie Company on Monday. In honor of Tax Day, all guests are invited to visit their local Bananas Smoothies & Frozen Yogurt for a FREE small, plain frozen yogurt! Thanks to Nick for this tip. Get a half chicken individual meal and a drink for $10.40 through April 15. Learn more here . On Monday, April 15, Kona Ice is hosting its sixth annual "Chill Out Day." Trucks throughout the country will be parked at various spots handing out free shaved ice, letting everyone take a breather and relax after a stressful time. I would call your location before going to make sure they're involved in this special. Download the Bruegger's Bagels mobile app or sign up for an account and get 13 bagels and two tubs of cream cheese for $10.40. Download the BurgerFi app and get a BurgerGi double cheeseburger for $4.15 (as in April 15) on Monday. One cheeseburger per person (premium toppings will have an upcharge). Offer valid only at participating locations for the BurgerFi Cheeseburger – available only by joining BurgerFi Rewards and redeeming offer through the mobile application. Thanks to Falyn for this tip. BJ's is offering half off a large deep dish or tavern-cut pizza all day for dine-in, takeout or delivery orders. They're also waiving delivery and service fees from now until May 5. Get a traditional cheese pizza for $10.40 at Grimaldi's all day. If you see a deal, email me! Debbie@TheDenverChannel.com and follow me on Facebook .